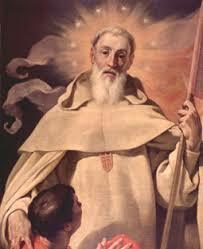 St Peter Nolasco founded the Mercedarian Order devoted to ransoming slaves from the Moors. Patrick Duffy writes a note about the saint and the order he founded. Peter was born near Carcassone in France of a merchant family and grew up as a pious young man. His father died when he was fifteen and Peter inherited a considerable fortune. He moved to Barcelona, Spain to avoid the Albigensian heretics. He took part in the Crusades against the Albigensians in southern France. Later he became tutor to King James I of Aragon and settled in Barcelona and became a friend of Saint Raymond of Penyafort. He used his large inheritence to ransom Christians held prisoner by the Moors. Raymond of Pennafort in 1218 had started a lay confraternity for ransoming slaves from the Moors and Peter became the procurator for this. Peter twice served as a captive in Africa. Later, in 1230 and with papal approval Peter became the head of the Order of Our Lady of Mercy. Mercedarians – merces is a Latin word, meaning “mercy” or “ransom.” The order was devoted to ransoming Christians. He sought to free others held captive by ropes , nails or chains as St Peter the apostle was. Peter was its Master General until 1249. During a visit to Valencia and Granada, it is claimed that he ransoned 400 Christians. Later his Order spread through most of Spain and was closely associated with the reconquista of the southern provinces from Islam under los reyes catolicos, Ferdinand and Isabella up to 1492. The papacy confirmed Peter’s cult in 1628 and extended it to the Universal Church in 1664. 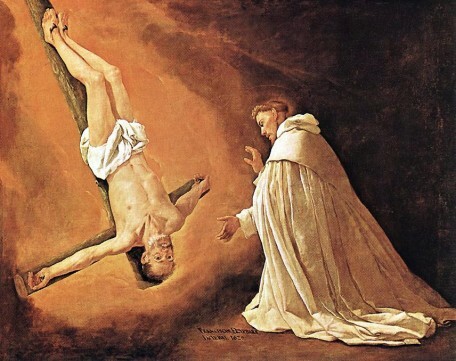 A fine series of paintings of the saint by Zurbarán survives at the Prado, Madrid.